If using fresh jalapeños, taste test them first. Some jalapeños can be very hot and some can be as mild as bell peppers. If you get scorching chiles, you may want to scale back a bit. If they are too mild, taste the seeds, if there’s heat in the seeds, make sure you use the seeds. If the chiles just aren’t hot, add some chile pepper flakes to the batter. 1. In a large bowl, whisk together the cornmeal, flour, baking soda and salt. 2. In a separate bowl, whisk together the yogurt, milk, and egg. Pour into the bowl of dry ingredients and stir to combine. Stir in the melted butter, the chopped jalapeños, corn, and cheese. To Make Muffins: Divide batter among muffin cups, filling each three-quarters full. Bake in 375 degree oven until a cake tester inserted into centers comes out clean, about 15-25 minutes. Let muffins cool in tin 5 minutes. Turn out into a basket or bowl lined with a clean kitchen towel; cover to keep warm. Serve with honey. To Make Cornbread in Cast Iron: Heat pan for several minutes in the oven while you are mixing the batter. Pour batter into oiled, hot cast iron pan. Bake at 375 degree oven for 15-25 minutes. 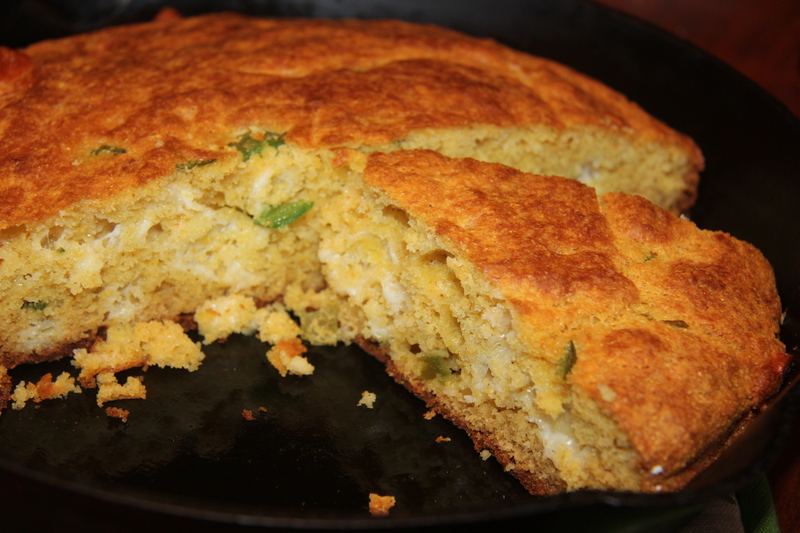 Let the jalapeño cornbread rest in the skillet for 10 to 20 minutes before cutting wedges and serving. Remember that the skillet is still very HOT. Keep a pot holder draped over the handle, or rubbing the handle with ice to cool it down.